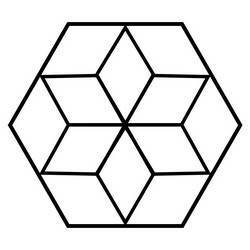 One of the prettiest designs to piece together is the “Star”. 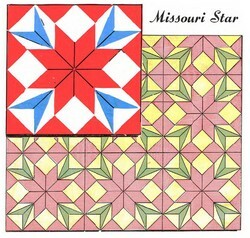 Here is a variation of this popular pattern – on the bed, a white star against a colored background known as “Texas Star”; a two-tone star on a colored background called “Hexagonal Star”, or in northern New York during 1800’s known as the “Rising Star”. 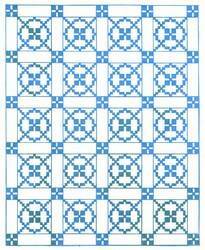 Click on the image to print the template for the Rising Star Quilt Pattern. For 2 colors: 4 3/4 yards in white; 5 1/4 yards in grey; 1 3/4 yards of 39” wide material in grey for border. For 3 colors: 2 1/2 yards in white; 2 1/2 yards in blue; 5 1/4 yards in grey; 1 3/4 yards of 39” wide material in grey for border. 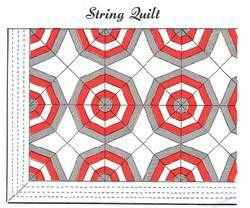 Start at center by making a star; then stitch outside units in place to form hexagon. 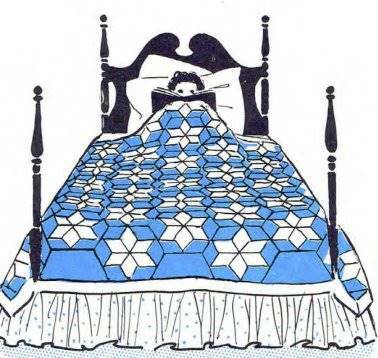 Make 4 strips, each 10 hexagons in length; then 3 strips, each 9 in length. Stitch strips together, starting with a 10-hexagon strip and alternating with 9-hexagon strips. 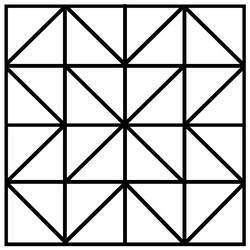 After setting strips together, place quilt-top on flat smooth surface (such as the floor). Place sheet of wrapping paper under quilt (having it extend out along edges) and pin in place. 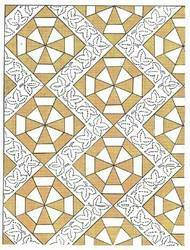 For fill-ins, trace off open sections; one-half hexagon (#1) on top or bottom of quilt, corner (#2) and side (#3). 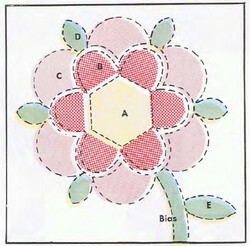 Cut out and use as pattern pieces. Place these patterns on grey material and allowing 1/4” for seams around entire piece, trace off and cut six of #1, four of #2 and eighteen of #3. Stitch in place along edges to complete quilt-top. 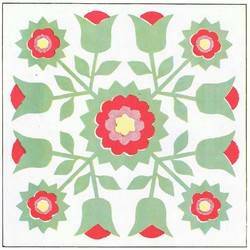 Cut border material into crosswise strips each 6” wide and 39” long. Piece together to form two strips, each 78” long for top and bottom of quilt, and another two, each 116” long for sides of quilt. Lining and Interlining are optional. Using unit seams as guide lines, quilt entire top in diamond design going through plain sections. 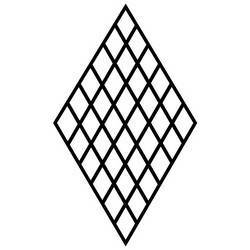 Quilt around entire inside edges of border, or quilt in diamond design. 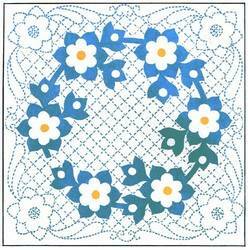 Use a fine running stitch with matching quilting thread.